Researchers from the Boston University School of Medicine and VA Boston Healthcare System (VABHS) have discovered a new biomarker to detect progressive degenerative brain disease, chronic traumatic encephalopathy (CTE), in living patients. CTE, which is determined in people with a history of repeated head trauma, can currently be detected only after death through an autopsy. Researchers observed that the biomarker, the protein CCL11, is expected to help recognize CTE from Alzheimer’s disease, which frequently often presents with symptoms similar to CTE. The diagnosing of CTE in living patients will enable to develop possible therapies for the treatment of the disease. The study first author Dr Jonathan Cherry, along with other researchers, studied the brains of 23 former college and professional football players. During the study, the researchers compared them to the brains of 50 nonathletes with Alzheimer’s disease and 18 nonathlete controls. They determined baseline levels of CCL11 in the brains of the nonathlete controls and the nonathletes with Alzheimer’s disease, while the CCL11 levels were significantly raised in the brains of people with CTE. Researchers have taken the postmortem samples of the cerebrospinal fluid (CSF) from four of the control individuals, seven of the people with CTE, and four of the people with Alzheimer’s. They detected that CCL11 levels in the CSF were similarly normal in the control individuals and people with Alzheimer’s, but advanced in those people with CTE. BU’s CTE Center director and study senior author Ann McKee said: “This is a step forward from our knowledge gained in understanding CTE from brain donations. 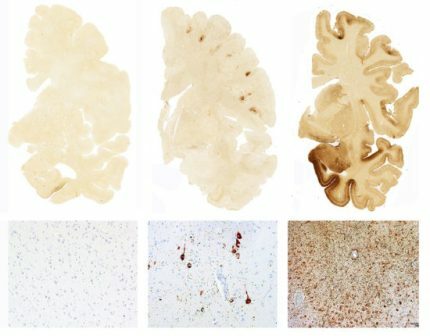 Image: A sample of normal brain tissue (top, left), alongside samples showing mild and severe CTE. Photo: courtesy of Ann McKee.